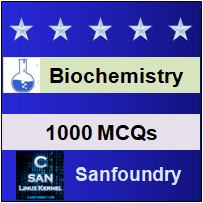 This set of Biochemistry Multiple Choice Questions & Answers (MCQs) focuses on “Regulation of Metabolic Pathways”. 1. Which out of the following statements is true about regulation of metabolic pathway? Explanation: According to the physiological needs, rate of metabolism needs to be changed. Explanation: The rate of breakdown of metabolites is termed as steady state. Explanation: Diminished delivery of oxygen to tissues is termed as hypoxia. Explanation: Diminished flow of blood to tissues is termed as ischemia. 5. Which of the following statements is true about the control of muscle glycogen phosphorylase? Explanation: It is allosterically inhibited by ATP. It is partially activated allosterically by AMP. Normally it exists in inactive form. 6. Which of the following is not a factor determining the activity of an enzyme? Explanation: Association with regulatory protein, sequestration, allosteric regulation and covalent modification are the factors determining the activity of an enzyme. Explanation: A high insulin/glucagon inactivates lipolysis. 8. Which of the following type of metabolite is used for generating glucose under severe starvation conditions? Explanation: Fats cannot be converted to glucose; there is no store of carbohydrate. Only amino acids can be used for generating glucose under severe starvation conditions. 9. Which of the following statements is true about brain metabolism in starvation? Explanation: Brain does not use amino acids directly but glucose derived from glucogenic amino acids in the liver. Explanation: Phosphorylation of enzyme is reversible; phosphorylation is not carried out by phosphoprotein phosphatases.